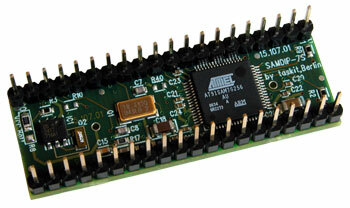 SAMDIP-7S is a small microprocessor ARM7 board designed to be as simple as possible to use. It contains a low-power, high-performance ARM7TDMI processor core with a large variety of peripherals and needs as less as possible of external components. For individual purpose SAMDIP-7S is available in three versions. 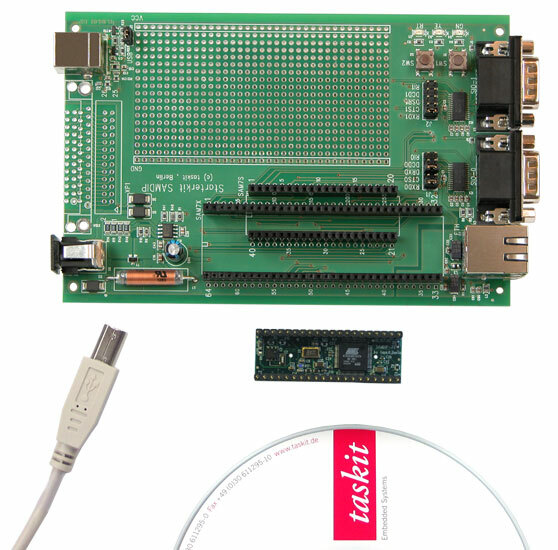 The Starter kit SAMDIP-7S evaluation board is the perfect interface for development and hardware designs including the SAMDIP-7S. 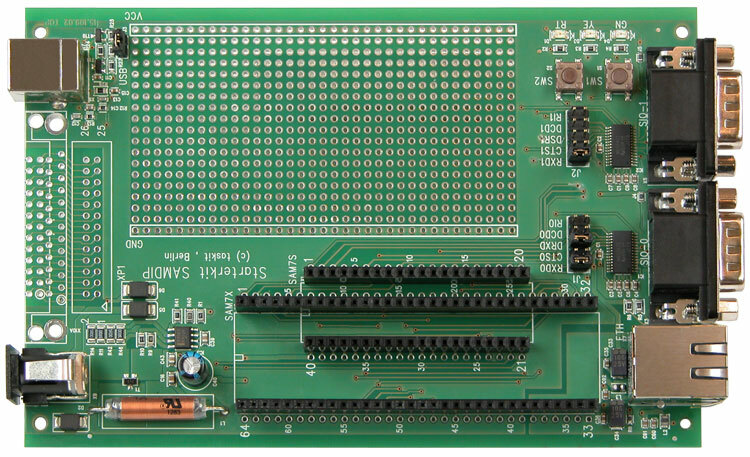 To access all the IO pins the processor offers in a simple way SAMDIP-7S is designed as standard 40 pin DIP package to be easily integrated in every circuit. It's great range of peripheral interfaces makes it suitable for any application by providing USB 2.0 at 12 Mbit per second, TWI, SPI and very flexible USART that support RS485, IrDA, ISO7816 as well as Manchester Encoding. A fast on-board DMA controller cares about data transfers from or to these devices conserving processor capacities. Eight ADC channels and a PWM unit allow interaction with additional hardware. 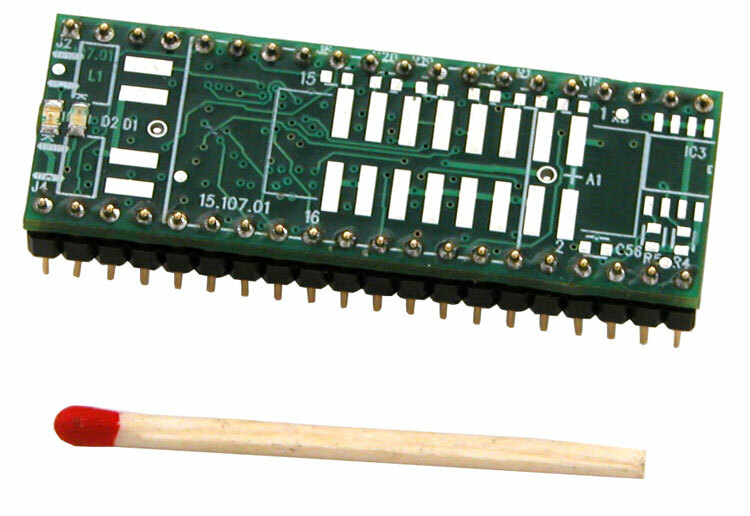 The ARM7 board is either available with 16 KB SRAM and 64 KB Flash or with 64 KB SRAM and 256 KB Flash. There are also a JTAG interface and a real time clock with serial EEPROM. Depending on their memory requirements, programs can either be executed in Flash or -- for better performance -- in SRAM. 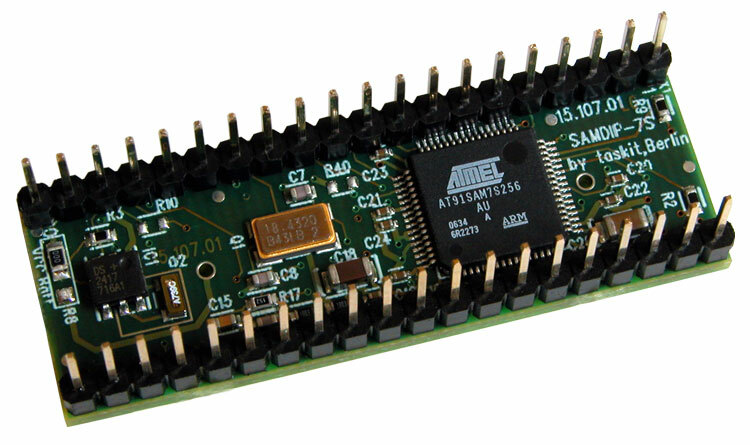 Atmels integrated SAM-BootAssistant (SAM-BA) alleviates programming of SAMDIPs Flash memory (find more information in our manual). Programs can be written in C using WINARM for example. 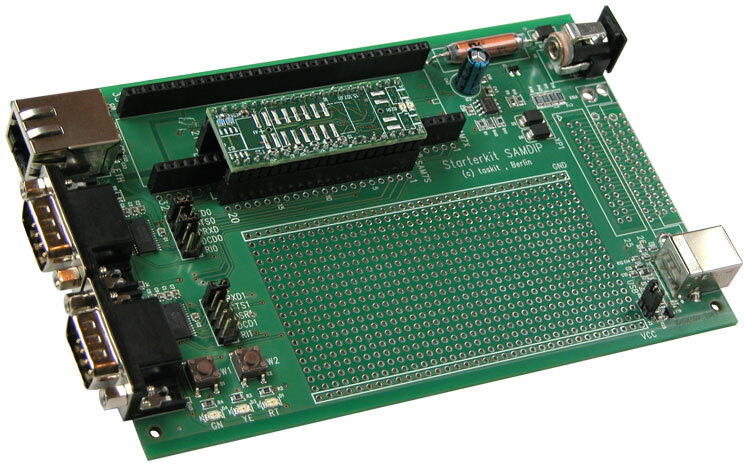 For testing and development but also for products the Starter kit SAMDIP-7S evaluation board is perfectly suited. It contains the needed circuits for USB, RS232C and power supply and offers room for own circuits and a self defined 26 pin DSUB port. The USART are available at two male DSUB connectors whose pin assignments are configurable by jumpers. 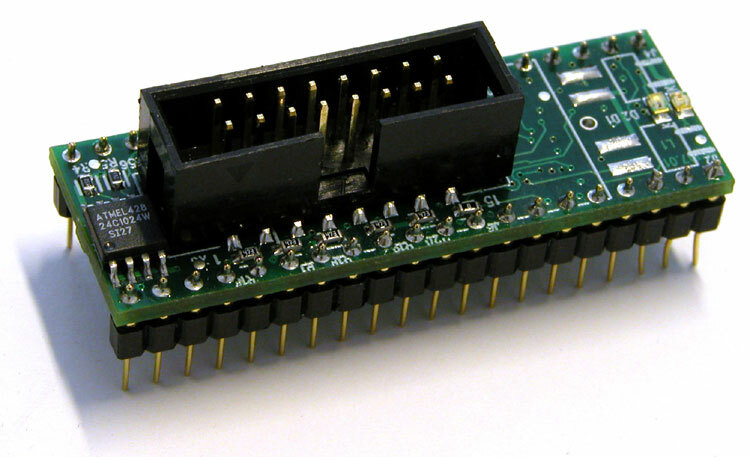 The 40 pin socket allows the easy replacement of SAMDIPs so this board can also be used as programming board. Two switches and three coloured LEDs are disposable for testing.